Fountain pens are a delicate writing instrument that can bring years of enjoyment when properly used and maintained. 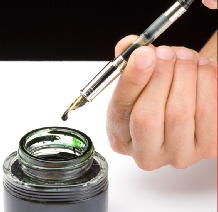 Below are helpful tips on using, maintaining and servicing your fountain pen. When properly held, the fountain pen nib should be upright so you can see the engraving. Both tines at the tip of the pen should contact the paper at the same time. Do not apply pressure when writing, the weight of the pen is sufficient. Use only ink designed specifically for fountain pens. 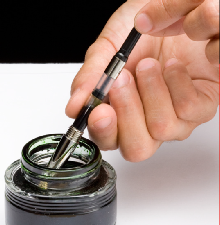 India ink and calligraphy ink can cause permanent damage to a standard fountain pen nib. Only use calligraphy ink on calligraphy nibs. High quality ink jet paper works well with most fountain pens. Avoid coated and low quality “fuzzy” paper as it collects on the nib causing the ink to bleed. There are many types of “high-end” paper that are designed for fountain pen use as well. 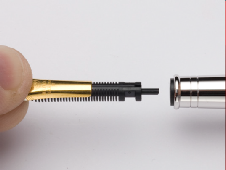 If your fountain pen will not be used for an extended period of time, remove and clean the nib, feeder and converter to prevent clogging and ink evaporation. Always store your pen with the nib in an upright position. This allows the ink to drain from the nib when not in use. Twist the end of the converter until the piston is against the filling end. Press the converter onto the nib. Dip the nib assembly into the ink then twist the end of the converter until it stops. Twist the end of the converter back and forth completely several times to ensure the converter is completely filled (figure A). If the converter does not draw ink, position the nib further into the ink. 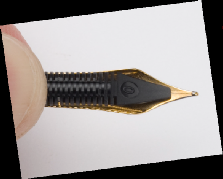 To prime the nib so that it’s ready for writing, gently twist the end of the converter until it produces a small drop of ink (figure B). Wipe away excess ink from the nib with a paper towel or lint-free cloth. Do not use a tissue as lint may become lodged in the nib causing ink flow inconsistencies. Press the ink cartridge onto the nib until firmly seated. Gently write on a scrap of paper to begin the ink flow. The nib and feeder assembly should be cleaned frequently for best performance. To remove the nib and feeder assembly, place a tissue over the nib assembly and gently pull the assembly out of the end of the pen. This typically will not require much effort unless ink has dried in the assembly. To reassemble, place the nib on top of the feeder and align as shown (figure C). Align the nib assembly with the opening in the nib holder (figure D) and press into place (figure E). Fountain pens should be cleaned once a month (or when clogged). Remove the ink cartridge/converter, disassemble the nib assembly and flush with tepid water. It may be necessary to let the nib and feeder soak for several hours if severely clogged. Gently brush the feeder “fins” to remove dried ink if necessary. Blow out excess water before installing the ink cartridge. Dry the nib and feeder with a soft, lint-free cloth. DO NOT use hot water or solvents as this may damage the nib and/or finish.